1. Refuse to get out of bed until the absolute last minute even though each kid has come in twice to report on everything from the content of their dreams to details of their current Lego creation to the quality of their bowel movements. 2. Walk into the kitchen only to find that it and the living room look like something from The Hangover even though everything was in its place when you stumbled into bed 6 hours earlier. 3. Have a mini-stroke and go back to bed. 4. Try hard to ignore the increase in decibels coming from the other room. 5. Give up on sleeping, say a small prayer, and get up for a second time, hoping that somehow things are better. 6. Find that very little has changed but muster up all of your patience to calmly tell the children that you will make pancakes if they get things cleaned up. 7. Meet resistance. They want waffles. 8. Agree to make waffles while desperately wracking your brain to remember where you put the waffle iron. 9. Experience a wave of relief when one of the kids runs to the right cabinet and excitedly pulls out the waffle iron. 10. Have second thoughts when you realize they've pulled out the Darth Vader waffle iron. 11. Tell the kids to get out the ingredients while you go to brush your teeth in an attempt to buy yourself a few more minutes of peace and quiet. 12. Be met by an anxious pre-teen who tells you he can't find any pancake mix. 13. Tell him to look again. And, then again. 14. After he tells you that he can't find it a third time, look for yourself. 15. Realize too late that the three attempts to find pancake mix have triggered an ASD anxiety-induced meltdown. 16. Try to talk your pre-teen down from his meltdown while rummaging through the pantry. 17. Determine that there is indeed no pancake mix in the house and that you don't have time to go out and buy some. 18. Look in three other cabinets hoping that pancake mix will somehow miraculously appear while simultaneously debating the merits of running to the grocery store at this time on a Sunday morning. 19. Suppress your growing sense of panic when the younger two children come to see what all the racket is about and immediately insist they be able to help. 20. Despite your best efforts, watch as the melting down older son triggers a completely different (but equally difficult) response in the younger son. 21. Dodge incoming jab, shoves, and the occasional flying object from melting down younger son who is overwhelmed by the noise and chaos. 22. Hand younger son an iPad in an attempt to keep him from single-handedly triggering the apocalypse. 23. Grab your Kitchen Survival Guide (seriously, you guys, my mom gave this to me for college graduation, and I STILL use it more than any other cookbook I have) and frantically search for a waffle recipe. 24. Realize (with a wave of relief) that you have all the ingredients the recipe calls for. 25. Talk your older son down from his meltdown by giving him the job of measuring everything. 26. Plug in the Darth Vader waffle iron and try to remember how you're supposed to know when it's hot enough. 27. Help pre-teen find and mix everything while demonstrating the difference between sifted and unsifted flour but not before rummaging through the cabinets as you try to remember whether or not you have a sifter (you do). 28. 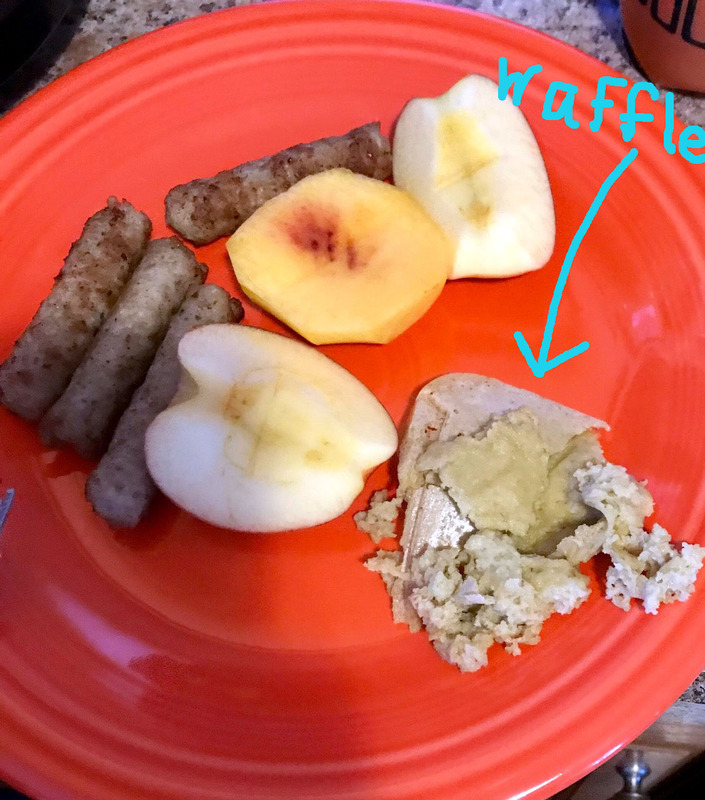 While you're waiting for the waffle iron to heat, send the pre-teen to the garage freezer to look for sausage links. 29. Immediately regret that decision as he can't find sausage either and retreats to his safe space in an attempt to avoid a second meltdown in an hour. 30. Go to the garage and get the damn sausage yourself. 31. Start heating the sausage and realize that finally the waffle iron is ready. 32. Put the first batch of batter in. 34. Try to ignore your 12 yo who is in the other room muttering under his breath about how big a mistake your failure to just go to the grocery store and buy more pancake mix was. 35. Wonder whether the light was supposed to be on or off and open the waffle iron to check. 36. Decide the light is supposed to be off. 38. Realize you can't keep the 6 y.o. distracted by iPad videos forever. 39. Tell him to get out forks and put fruit on all the plates. 40. WILL the waffle iron to heat the waffle faster. 41. Peek inside the waffle maker again and decide there's no way you're making church, especially since the 12 yo is starting to panic again, and the 6 yo is freaking out about not having a waffle, yet. 42. After waiting for 30 minutes with no luck, get out the back-up waffle maker.....you know, the one you got for your wedding but completely forgot you had. 44. Try to remember if the green light is supposed to be on or off. 45. Decide it's supposed to be off. 47. 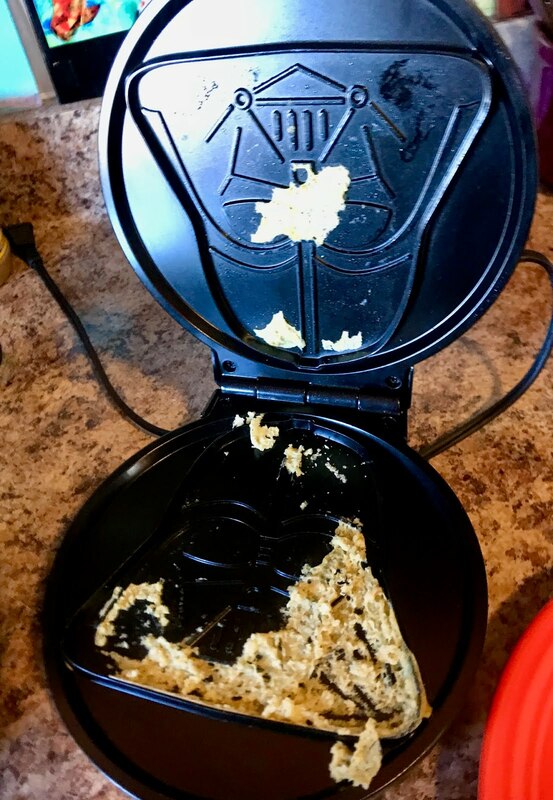 Even though the Darth Vader waffle is clearly not done, scrape it out of the waffle maker and give half of it to each of the younger kids since they're the only ones around and seem desperate enough to eat anything. This all-American breakfast brought to you by Moe, the world's greatest mom. 48. As you're putting batter into the back-up waffle maker, realize you only have enough for one more waffle. 49. Begin negotiations with three children to figure out how to avoid World War III. 50. Wish you never got out of bed. Oh my, I'm exhausted just by reading... I hope your day got better.